Shrimp plant (Justicia brandegeana) earned its common name from its curved, segmented flower bracts, which resemble 3- to 6-inch-long shrimp. It needs little hands-on maintenance once established and will survive through drought and heat with no permanent damage. Shrimp plant will perform best under ideal growing conditions with regular watering and feeding. Shrimp plant comes from Mexico, so it is adapted to growing in subtropical or tropical climates. It remains evergreen year-round in U.S. Department of Agriculture plant hardiness zones 9 to 11, but will also grow in USDA zone 8 with some protection. A shrimp plant grown in USDA hardiness zone 8 may be killed to the ground by frost, but is likely to return from the roots in spring. In cooler climates, grow shrimp plant in pots and overwinter it indoors in a brightly lit room where temperatures stay above 40 degrees Fahrenheit. The right growing conditions help ensure a shrimp plant's long-term health and prolific blooming. Sun is particularly important because it has a tremendous impact on flower production and the plant's color. Full sun is fine in cooler climates, but it can fade the flower bracts over time. On the other hand, low light inhibits blooming. Strike the right balance by choosing a sunny spot with light shade during the hottest part of the day. A bed with moist, moderately fertile soil is best, but a shrimp plant will adapt to different soil types as long as it is fast draining. No matter what, choose a spot that has at least 3 square feet of space for each shrimp plant to accommodate its mature size. Soil moisture also affects the appearance of a shrimp plant. 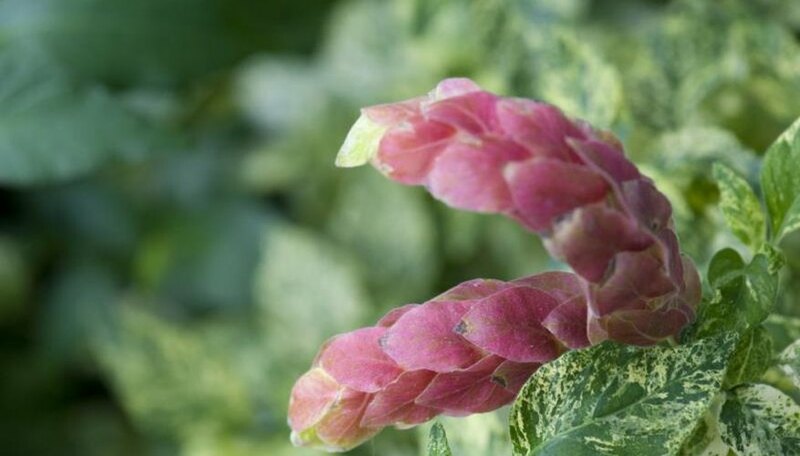 Both too much and too little water cause leaf loss, although an otherwise healthy shrimp plant will withstand a light wilt with no long-term damage. Water a garden-grown shrimp plant deeply but infrequently, providing 1 inch of water weekly during the summer. During times of extreme heat or drought, water twice weekly. A potted shrimp plant requires water whenever the soil dries out on the surface. Add water until the soil is saturated and the excess moisture trickles from the pot. Always use a pot with drainage holes. Reduce watering in fall and winter, allowing the soil to dry out and the plant to wilt slightly between waterings. Shrimp plant needs plenty of fertilizer during its active growing season, from spring until late summer. The vigorous growth requires more nutrients, especially when the shrimp plant is grown in a pot, which has limited soil reserves. Prepare two fertilizer solutions, one with general purpose, 15-15-15 ratio fertilizer and the other with 7-9-5 ratio fertilizer to support flower production. Dissolve 1/2 teaspoon of each fertilizer in 1 gallon of water. Alternate between the two fertilizer types, replacing one watering per week with the solution. A shrimp plant grown in high light or a sunny bed requires more fertilizer than one in a shady spot. If the leaves blanch or turn yellow, or if they drop prematurely, increase fertilizing to twice weekly until the plant looks green again. Although not technically invasive, shrimp plant can escape cultivation and become naturalized in warmer, subtropical areas where frosts are rare. To prevent its spread, grow shrimp plant in a container or in a garden bed with a concrete surround. Prune off the flowers after they fade to prevent accidental self-seeding and throw pruned clippings into the trash to keep them from rooting.